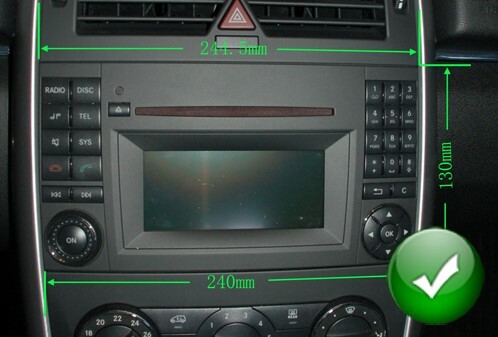 radio Mercedes Class A/B Vito viano running the Android operating system, such as smartphones. Include uses that were far more a matter of the computer : Google Maps, voice search , location, etc. Car radio Mercedes Class A-B Vito viano sprinter has an entertainment center for multimedia communication and navigation .It has a CD / DVD with all that he is able to play DVDs, DIVX, MP3 and photos . " Its touch screen 7 allows you to take full advantage of its features beforehand with an intuitive and easy to use interface. Its GPS module running on a Windows CE or ANDROID (option), allows you to navigate with ease and make you aware of the presence of any radar. The term Double -DIN , which means it is twice the size of a normal car radio slot . There is also a USB input and a video input and 1 video output , allowing you to connect a reverse camera , game console or other video sources. It also has two audio outputs for amp. + CANBUS. Micro SD . Accepts SD card up to 32GB ID3 ( MP3: Name the artist, album title , song title ) . 50 TV channels for free France and all the countries of Europe , Multi language / Multi Region comprises France makes a reception while driving 120KM / H.
AM / FM Rds 30 submissions, research stations automatically or manually , TA / PTY ect function . ... Caller ID station ( Rds ) . Caller ID , redial, hang up and stall , depending on mobile phone directory . Ipod control. Connect your iPod and drive it from the screen of the receiver . Charges your iPod at the same time . You can connect a rearview camera and a game console . ( German French , English , 17 languages ... ) intuitive graphical interface. Order directly via the touch screen. Infrared remote control . Original remote driving with auto -learn commands . Accessories: Manual , remote control, GPS antenna , DVB-T antenna , AV cable , USB cable, Ipod cable , ISO cable + CANBUS, 2GB SD (GPS EUROPE Route66 , Igo8 or Tom- Tom) . This product is revolutionary and it will allow you to have a very high-end equipment in your car, at the best price .